Those who know of my Sydney garden via this blog will know that I am in mourning, in mourning for my fabulous citrus trees that I had to leave behind. 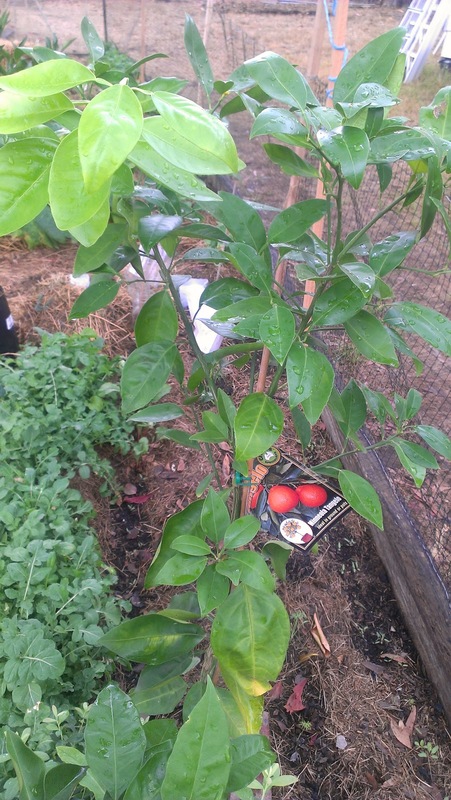 My Sydney garden had a large lemon tree that kept us supplied year round and two wonderful espaliered Tahitian Limes. When we left Sydney for our bush life, the only citrus I could take with me was my finger lime, Colette, who was in a big pot. So what's the citrus situation at the new patch? 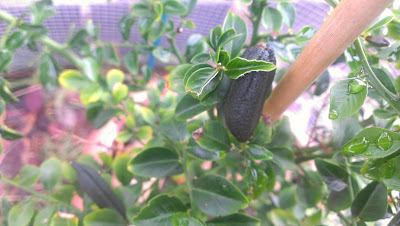 First my 'old' citrus, Colette (that's her variety) the finger lime. After many false starts where flowers appeared and fruit set but soon fell off, I finally have fruit that has stayed on and swelled. There are about 8 fruit forming now, there would have been 9 but the wallaby ate one (yeah, yeah, the dog ate my homework... but it's true, it's true!). Finger limes are Australian natives and are typically under-story shrubs in the rainforested areas of northern NSW and further north. They come in all sorts of wonderful colours, Colette has dark green to black skin with lime green citrus bubbles inside. I can't wait till these fruit are ready to pick. My biggest worry with Colette is that she is totally unsuited to our climate which is a Mediterranean climate with frosts through winter (I need to get a frost cloth or keep her on the verandah when it gets cold). And my new citrus? Well, I have only just started buying the plants I want to put in but here are my first three new citrus babies. This is a Minneola Tangelo. Tangelos are a cross between a mandarin and a grapefruit. Fancy that, been buying the fruit for years and never knew that. This kind of tangelo has a 'neck' to the top of the fruit which gives them quite a distinctive look. Apparently they are more cold tolerant than grapefruit but they are not frost tolerant... hmmm, maybe I have made a mistake in buying this one? However others living around the area all say that they grow citrus of many sorts successfully apparently once they are established they don't 'feel the cold', so the trick appears to be nursing them through the first few winters. They do need long hot summers to allow the fruit to ripen and we certainly have those. They have about the same drought tolerance as oranges which is quite high. Underneath the bagged baby citrus is some of my rocket crop. This is a Seedless Valencia Orange. Apparently they are later fruiting than many oranges but otherwise similar to Valencias. 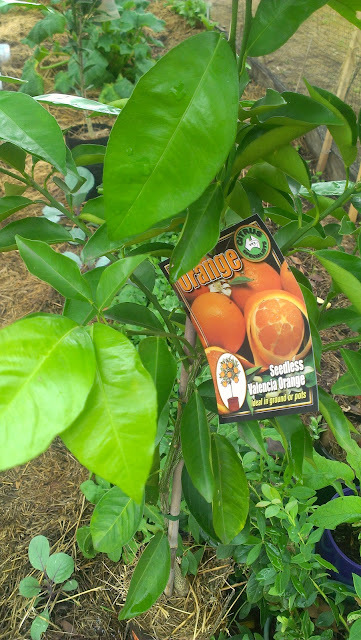 Oranges of all sorts can cope with really hot temps over summer (we can provide that! ), but vary in their cold tolerance. Tucked underneath and also in pots are two blueberries, a comfrey plant and in the ground a baby Drum head red cabbage. And my third baby new citrus is an Imperial Mandarin. Here she is standing imperially in her bag over the Drum head red cabbages and the tiny recently emerged sugar snap pea babies. 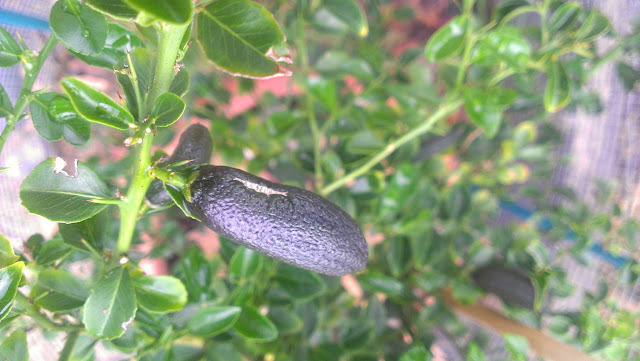 It has much thinner leaves than the other two citrus. 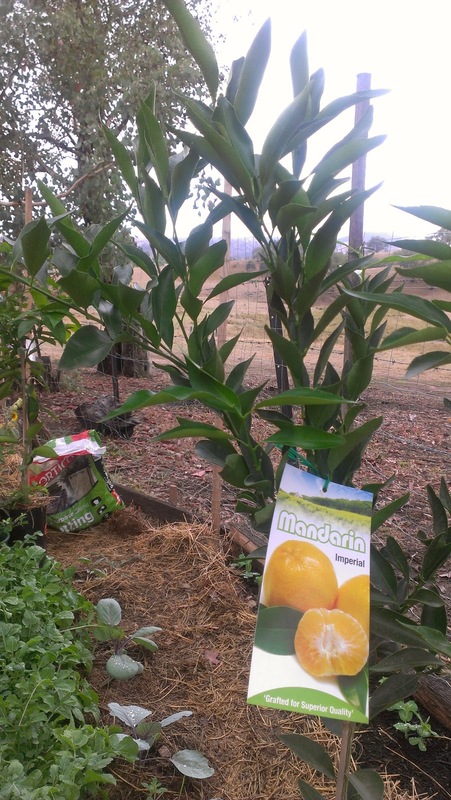 Apparently mandarins tolerate the cold a lot better than oranges, apparently Ellendale is the most frost-tolerant and I might go on the hunt for that variety too. Anyone out there have experience of growing citrus in frosty areas? Any advice? Do you use frost cloths or do the food forest type of thing to protect them? Do you load them with seaweed solutions? And when it comes to lemons, which variety from your experience is most frost -tolerant? I have heard conflicting accounts that Eureka is best or that Meyer is best. Hoping that your citrus are doing well. Oh Colette is doing well. How big is that fruit? Its difficult to get an idea of scale in photos - my lime has much smaller leaves. My parent's place gets frost and they grow both Eureka and Meyer Lemons (as well as Tahitian Limes) very successfully. Both are planted against walls and they get light rather than heavy frosts but frosts nonetheless. 4cms and getting bigger each day with all the rain we are having. glad to hear of your parents citrus successes and wall positioning, I am particularly impressed with their limes! Zucchini Tuesday - I want cake!